If you’re a Quentin Tarantino fan, you’ve probably heard the name Rolling Thunder, but you may not know its origin. In the mid-nineties, Tarantino started his own distribution company called Rolling Thunder Pictures, which specialized in theatrical and home video re-releases for some of his personal favourite grindhouse B-movies such as Switchblade Sisters and Detroit 9000. Unfortunately, it wound up folding after only a few years, but Tarantino named his company after an underrated 1977 grindhouse revenge flick that was one of his personal favourite films. In 2002, the British Film Institute had a poll where they asked famous directors to list their ten greatest films of all time and while a lot of them went with the obvious choices like Citizen Kane or The Godfather, Tarantino put Rolling Thunder at #5 on his list. It’s a real shame that Rolling Thunder Pictures is no longer in business since it could have given that film a lot of the recognition that it deserves. As of 2010, for reasons I cannot understand, Rolling Thunder has yet to be released on DVD in North America! I guess it’s up to people like Quentin Tarantino and myself to keep this film’s legacy alive. 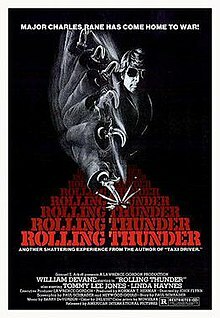 Despite its stigma of being an exploitation picture, Rolling Thunder is actually a far more intelligent and subtle revenge film than you’d think. It was directed by John Flynn and co-written by two top-notch screenwriters, Heywood Gould and Paul Schrader. This was Schrader’s first produced screenplay after Taxi Driver and also tackles the issue of former Vietnam veterans who have trouble adjusting to civilian life again and wind up turning to violence. It was implied in Taxi Driver that Travis Bickle’s problems may have been triggered by experiences in Vietnam, and Schrader delivers an equally fascinating character here. At the beginning of the film, Major Charles Rane (William Devane) and Sgt. John Vohden (Tommy Lee Jones) have just returned home to Texas after serving in Vietnam. Rane has spent seven years in captivity as a P.O.W. and his experiences and have clearly made him a much different person. He has a very difficult time adjusting to civilian life again and reconnecting with his family. His son was only 18 months old when he shipped off to Vietnam and barely remembers him at all. His wife has become engaged to another man during his absence and is unsure if she wants to remain with her husband. The only person he seems to connect with any more is a local waitress named Linda (Linda Haynes), who has a massive crush on Major Rane and almost considers herself his groupie. In a local ceremony, Rane is presented with 2555 silver dollars which represent each day he had to spend in captivity. Unfortunately, a quartet of thugs soon shows up at his house, wanting to steal the silver dollars for themselves. They torture Rane in order to get him to tell them where the silver dollars are hidden, but his experience as a P.O.W. has made him oblivious to this punishment and he refuses to crack even after they shove his right hand into the garbage disposal! However, Rane’s stubbornness turns out to be disastrous when his wife and son return home and are murdered. Rane is also shot and left for dead, but he survives and recovers, attaching a steel hook to where his right hand used to be. After this, the film becomes a standard revenge story as Rane can think of nothing else but tracking down the men who murdered his family. He even gets Linda to come along, but it’s clear that she’s with him because he wants to use her as bait to lure the bad guys out into the open, not because he has genuine feelings for her. The middle section of Rolling Thunder does a have a few slow spots and doesn’t exactly have airtight plotting since it’s never really explained how exactly Rane knows where to go in order to find the villains. There are no really big surprises or revelations in this story, but this is a character study first and foremost, and a pretty damn good one at that. William Devane is simply terrific as Major Rane, effectively portraying a man of few words who can convey exactly what he’s thinking through his eyes and his facial expressions. It’s a wonderfully subdued and understated performance, particularly in scenes like when his wife tells him about seeing another man and he can barely muster a reaction. Devane has had a very solid 40-year acting career and has always worked steadily, but has rarely ever been given a lead role like this where he could showcase his talents. Linda Haynes makes a nice match for him as the extroverted, tough-willed Linda and gives a delightful performance, though she would permanently retire from acting a few years later. The role of John Vohden was one of the earliest acting jobs in the career of Tommy Lee Jones and even though this is only a supporting part, he pretty much steals the movie whenever he’s on screen and delivers several great moments of the brilliantly understated acting that he can do so well. One of the best sequences in the film involves seeing John at home with his family where he has clearly become bored and disillusioned with living such a mundane life again. However, when Rane asks for his help in going after his family’s killers, John’s eyes light up and he suddenly becomes filled with life again. Even though the buildup is a long and deliberate one, Rolling Thunder does climax with one hell of a violent and bloody shootout that really earns the movie its grindhouse reputation. The one moment where Tommy Lee Jones pretty much ensured that he would go on to become an A-list actor involves him leaping out of bed and casually proclaiming “I’m gonna kill a bunch of people!”. Despite being known as a grindhouse film, Rolling Thunder was never really intended to be one. It was scheduled for release by 20th Century Fox, but they backed out after being shocked by the film’s level of violence and apparently, there was one sneak preview of the film where the audience tried to physically attack the studio representatives! As a result, the film was sold to American International Pictures, the premier distributor of low-budget grindhouse B-movies for several decades. In spite of all the controversy the movie caused, Rolling Thunder really doesn’t seem all that violent today. In fact, when you watch it now, you realize that the whole movie is about 5-10 minutes of violence and about 90 minutes of dialogue. But I guess that just demonstrates how violence can sometimes have much a greater impact when it’s used sparingly and it involves very vivid and well-drawn characters. The infamous garbage disposal scene contains no blood and gore at all, as William Devane’s acting is all that’s needed to make the scene harrowing. In the end, Rolling Thunder is just a very solid revenge film with a lot more depth than you’d expect to find for this genre and while I wouldn’t follow Tarantino’s lead and place it on my “Top Ten” list, I will say that the movie is very underrated and deserves a lot more recognition than it’s gotten. At the very least, it deserves a damn DVD release!